Scott P. Klappa, MS is a clinical psychologist who works at Lifespan in Burnsville, MN. He completed his Masters of Science degree in clinical counseling from Rosalind Franklin University of Medicine and Science in Chicago, IL. Much of Scott’s research up to his point has focused on advanced statistical methods, hardiness, and compassion fatigue. Scott works with a variety of clients recovering from traumatic experiences as well as other conditions. Further, Scott is focusing research efforts on systems efficiency to directly benefit the Psychosocial Rehabilitation and Recovery Center, a VA facility in Great Lakes, IL. Overall, his research interests include pathoplasticity and the susceptibility of burnout, personality and mechanisms leading to engagement, general systems thinking, and quantitative methodology. Scott believes that the humanities are important in his practice of psychology in helping dismantle barriers to perception. 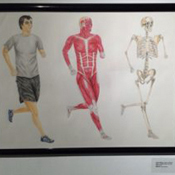 Sue Klappa, PT, PhD, and colleagues discuss how Doctor of Physical Therapy (DPT) students created visual..